catalog of the very different classes of planets in the universe. We'll discuss Pulsar planets, hot Jupiters, Super Earths, ice and water worlds, and many more. Scientists had initially believed that there were indeed other solar systems out there like our own but that these systems were more or less the same as our own—that is to say a system containing a single star orbited by no more then perhaps a dozen planets like our own solar system. Also, we had initially believed that the formation of exoplanets in other star systems was something which rarely occurred. And if it did occur, we believe that those particular star systems in the universe would be more or less as plain and vanilla as our own—stars orbited by a handful of planets. Our own solar system in this nook of the universe began as a flat accretion disk with an ultra dense and hot core. This core's mass, temperature and density would increase by pulling in adjacent particles according to Newton's law of gravity. This process of matter slowly accumulating in the core would continue until this core became sufficiently hot and dense to burn hydrogen into helium through a process known as nuclear fusion. This was the birth of the Sun. Smaller aggregates and clumps of matter in the accretion disk would also pull in adjacent particles via the force of gravitation. This process would continue until those clumps formed the then nine known planets. In this scheme, the final phases of our system's evolution occurred with the formation of organic chemistry and eventually life. All of these processes which shaped the evolution of our solar system and of our home planet occurred according to the laws of physics and chemistry. But the laws of nature are the same throughout the Cosmos. And it was for this reason that scientists had initially believed that all other star systems are very similar. But as we shall learn in this lesson, the latest scientific discovered prove that each star system is very unique and different from the others. We have, for example, discovered multi-star systems (up to four stars) orbited by planets. We have discovered strange exoplanets unlike any other planet in our system. And, furthermore, we have discovered that stars and planets are not the only things which are interesting about star systems. Indeed, just like our solar system has the Kuiper belt and Oort cloud, we speculate that perhaps most other star systems have the equivalent; this is something we'll discuss in greater detail below. 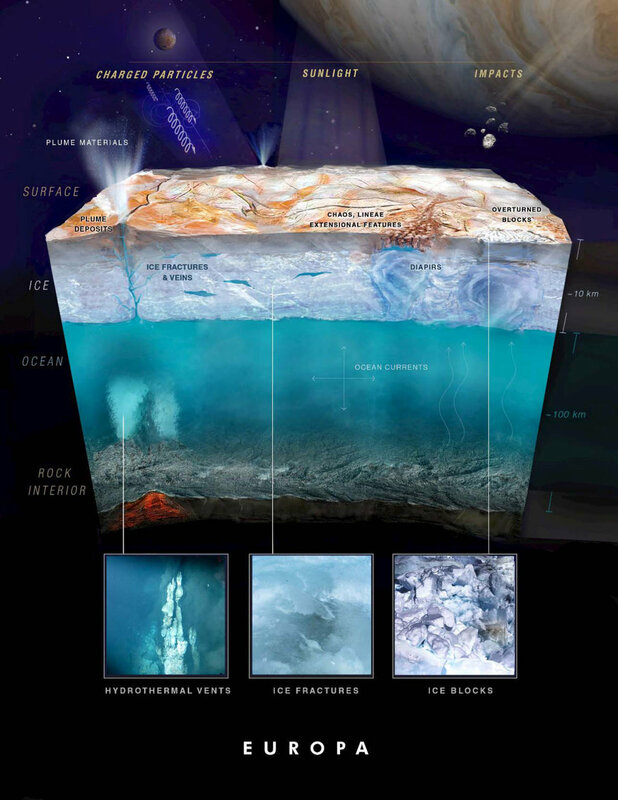 Artists impressions of subsurface oceans underneath thick ice sheets on Jupiter’s moon Europa and Saturn’s moon Enceladus. Top image by NASA. Our first hint that star systems were far more complex than merely a single star orbited by a handful of planets began with new explorations of our own solar system. Initially, we thought of running liquid water as rare in our solar system occurring only on the planet Earth. But our space probes and rovers reveal that liquid water exists in vast subsurface oceans on the planet Mars, the dwarf planet Pluto, and the Jovian moons Europa and Enceladus. Initially, we had believed that the extent of places which could be called "worlds" ended at Pluto. But Pluto, far from being a lonely isolated world at the edge of the solar system, is in fact the beginning of a vast realm of our solar system containing dozens of other planets and about a trillion icy comets. Every one of those planets and nearly all of those comets can be rightly claimed as worlds. These outer reaches of our system are known as the Kuiper belt. The discovery that star systems, contrary to what our natural philosophies (i.e. theoretical constructs formulated in the sciences of physics and chemistry) had lead us to believe about star systems being vanilla and uniform, are instead full of surprises and greatly varied echoes the sentiment in the Shakespearean quote mentioned at the begining of this article. In other words, as Feynman would say, nature is far more clever and imaginative than we are. Pulsar Planets and "Hot Jupiters"
The realization that other solar systems can be very different from our own occurred when the first exoplanet was discovered in 1992. This planet orbited a type of star known as a pulsar—an extremely tiny and dense star which can rotate up to about 30 revolutions every second! The fact that it was even possible for a pulsar to be orbited by planets shook the very foundation of our understanding of how planetary systems form. This is because a pulsar is formed when a very big star dies during a supernova. Supernovae are the most titanic explosions in the universe since the occurrence of the Big Bang some 13.8 billion years ago. Any planets orbiting a star should get obliterated after that star goes supernova. And yet, here was an intact planet orbiting a star even after the occurrence of a supernova, something we had originally thought to be impossible. Although there are hypotheses attempting to explain how there can be a planet orbiting a pulsar (one of these hypothesis states that the planet formed from materials ejected by the supernova explosion), the truth is that still to this day we are unsure how these kinds of planets got into orbits around pulsars. Artist's conception of a planet orbiting a Pulsar. The Pulsar's radiation blasting the exoplanet would cause its surface to glow. Artist's depiction of a so-called hot Jupiter orbiting its planet star. Another surprise came when we discovered gas giant planets, typically several times more massive than Jupiter, orbiting on average closer to their home star than does the planet Mercury orbit the Sun. (These particular kinds of exoplanets are often referred to as hot Jupiters.) These exoplanets were discovered by measuring the alteration in their home stars motion and deducing those planets mass (and, hence, their existence as well) using Newton's law of gravity. (This is something which we discussed in greater detail in the following article.) We had originally thought that gas giants could only form in locations very far away from their home star like the gas giants in our solar system. But this discovery demonstrated that we were wrong yet again about our understanding of planetary formation. In 2014, humanity launched the Kepler space telescope. This telescope detected exoplanets by observing a star dim as a planet passed in front of it. This method was profoundly limited since only planets which passed in between their home star and our line of sight could be detected. But despite this limitation, since the launch of the Kepler space telescope we have discovered over 3,500 exoplanets. Extrapolating this number to possible planets in star systems in our galaxy which cannot be detected by Kepler, astronomers deduced that there must be more planets than there are stars in the Milky Way. The formation of planets, far from being a rare occurrence, is actually very common. And, lastly, we discovered that all of those other planets are far stranger and more diverse than we could have ever imagined. Artist's depiction of the exoplanet 55 Cancri E. Image credit: ESA/Hubble [CC BY 4.0 (https://creativecommons.org/licenses/by/4.0)], via Wikimedia Commons. The earliest techniques used for finding exoplanets involved measuring the gravitational wobble of a star caused by the gravitational force exerted by a planet in orbit around that star. Very massive planets, such as gas giants, caused a much bigger wobble in its parent star and are therefore much easier to detect. It is therefore little wonder why astronomers kept detecting so many so-called hot Jupiters—these are the kinds of worlds which cause the biggest wobble in there parent star and are thus the easiest to detect using this method. For a while, astronomer had been detecting so many star systems with these hot gas giant worlds that they began to wonder if any other star system was like our own. But, as it turned out, the reason why we were finding so many hot Jupiters was because of the detection method we were using. Since we humans launched the Kepler space telescope in 2009 we have discovered thousands of new exoplanets. (As of June 2, 2018 Kepler had confirmed the existence of 3,786 exoplanets.) The Kepler space telescope points at and searches for exoplanets in a very small section of the sky in portions of the constellations Cygnus, Lyra, and Draco. All of those thousands of diverse worlds were discovered by looking at a very small portion of the sky only a little bigger than the portion of the sky containing the Moon. These exoplanets therefore represent a very small—albeit representative—sample of the stars and exoplanets contained within our galaxy. 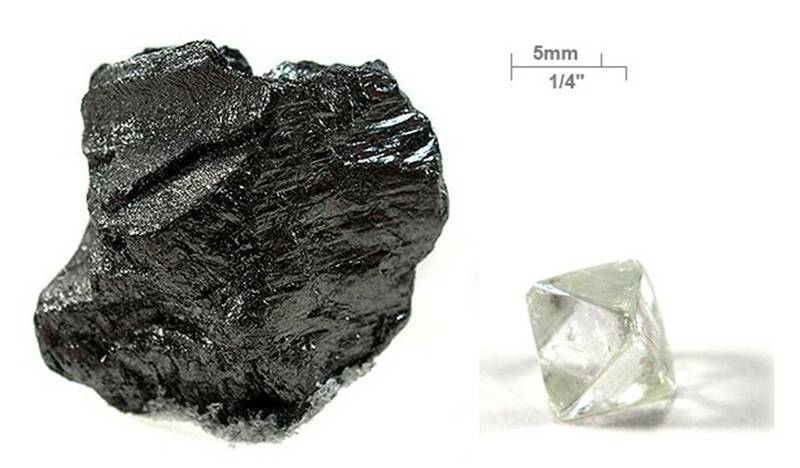 Graphite (left) and diamond (right) are both, essentially, just made up of a bunch of carbon atoms. The difference between the two substances is how those carbon atoms are arranged. When astronomers pointed the Kepler telescope at a star system known as 55 Cancri in the constellation Sygnus, it discovered an exoplanet named 55 Cancri E. This planet is one of the most exotic and strangest worlds we know of. If we were to hypothetically approach this world in a spacecraft, it would appear dark black with bright, white-hot, glowing lines interlaced on the planet's surface. The reason why the exoplanet would look black is because its atmosphere is composed primarily of carbon and the surface is made of mostly graphite. And the bright lines are materials spewing from the exoplanet's mantle through cracks along its crust. The mantle contains liquid diamond, a substance unknown to the Earth. When this material is spewed through the cracks along this exoplanet's crustal surface, some of that liquid diamond will crystalize as it gets ejected into the sky. This results in both spectacular light effects and dazzling landscapes of pure diamond dispersed across the planetary surface. 55 Cancri E is a diamond world. Here on Earth auroras are a phenomenon due to the interplay between the Earth's magnetic field and the Sun's stellar wind. Some of the high energy particles ejected from the Sun reach the Earth's magnetic field. The magnetic field exerts a force on these particles sending some of them on a collision course with the molecules in Earth's atmosphere at the north and south poles. The collision of the Sun's stellar wind with these molecules are what causes the stunning auroras we see here on Earth or from the vantage point of the International Space Station as depicted in the image on the right. On the exoplanet 55 Cancri E, these same kinds of effects occur but they are much more intense. 55 Cancri E orbits much closer to its parent star than does the planet Mercury orbit the Sun. 55 Cancri E orbits in a portion of its star's atmosphere known as its chromosphere; this exoplanet orbits, quite literally, inside of a star. For this reason, the stellar winds reaching this exoplanet's magnetic field are vastly more powerful than those interacting with the Earth's magnetic field. When some of the particles comprising this stellar wind are deflected by 55 Cancri E's magnetic fields along paths which result in those particles colliding with particles comprising 55 Cancri E's atmosphere, auroras are produced which are so intense that even the "dark side" of 55 Cancri E's surface (that is, the side facing away from its parents star) is bright and glowing. If one could stand on the surface of this planet without being vaporized and if they peered upwards the sky would appear to be glowing in an intense green and yellow color. This light show would be far more intense than even the most spectacular auroras seen on Earth or from the ISS. Given the ubiquity of diamond landscapes and the intensity of this world's auroras, visiting such a world and being there present on its surface would be an artist's dream. Imagine the jet black surface, the diamond mountains, the white hot magma spewing from the planet's mantle, and the spectacular auroras overhead. The problem, though, is the planet's 3,200 degree Fahrenheit surface would be a bit hot for the artist to stand on! Astronomers believe that more than half of all stars in the universe are orbited by planets. But there are also planets out there which do not orbit any star. These worlds are called rogue planets. A planet can become rogue by getting gravitationally flung away from its solar system by neighboring planets, planetesimals, and moons. Such an event typically occurs during the early stages of a solar system's formation when a protostar is surrounded by an accretion disk. Scientists believe that during these early stages of our own solar system's formation, dozens of planets were ejected from our system—they became rogue planets. It is also believed many worlds (including both planets and moons) got ejected from most of the other solar systems in the universe when those systems were very young and still forming. It is estimated that there are 2 to 100,000 times as many rogue planets as there are planets orbiting stars. 1. Heat still being generated after a world's formation—If a rogue planet is sufficiently large, then even billions of years after the formation of that rogue world, that world's core could still be hot and giving off energy and heat. 2. Energy from radioactive decay—Heat released by the radioactive decay of heavier elements could provide additional energy and heat. Imagine a hypothetical—and, by the way, totally plausible—situation in which a planet is formed close to the Milky Way's center. Suppose that this planet is a gas giant containing a handful of small moons and one large Earth-sized moon. Since star formation occurs more frequently near the center of our galaxy, we'd expect such a planet and all of its satellites to contain a lot of heavy metals. (Astronomers use the term "metal" to refer to all other elements in the periodic table besides hydrogen and helium.) Such a planet and its satellites would contain radioactive materials in their cores providing a source of energy and heat. Each moon would also generate heat and energy by the tidal action of the planet and the heat still being generated after those moons formation. It is the Earth-sized moon which would be of particular interest to us because this moon is so large that it would continue to generate heat after its formation for a very long time. Indeed, if that rogue moon contained a thick atmosphere with carbon dioxide or other greenhouses, heat generated from its core could get trapped and keep the moon warm. 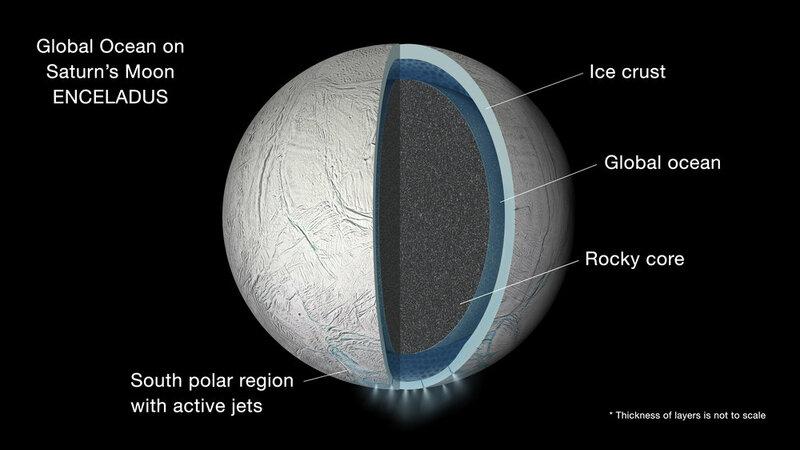 It would be possible for such a moon to have a subsurface ocean and possibly even an ocean on its surface. And it is also entirely possible that such a moon could support life. Thus, a planet or moon need not require a parent star for life—at least, simple life—to evolve on them. Size comparison of Kepler-186f (artist's impression) with Earth along with their projected habitable zones. The Kepler space telescope discovered an entire new class of exoplanets which, before Kepler, were completely unknown to us. This class of exoplanets is known as Super Earths—rocky, Earth-like planets ranging in size from slightly larger than the Earth to a little smaller than Neptune. One such planet is known as Kepler 186f located 490 light years away from the Earth. When the discovery of Kepler 186f was first announced in 2014, it generated a great deal of excitement within the scientific community. The reason being that this was the first exoplanet ever discovered which both was Earth-sized and orbited in its parent star's continuously habitable zone—a region of space surrounding a star which, if a planet orbited within that region, would orbit at just the right distance to maintain a surface temperature which is not too hot and not too cold for liquid water to run along that planet's surface. This means that if water is present on the surface of Kepler 186f, it would be in its liquid state. But is there water on this world's surface? As we discussed in this article, the prevailing theory of the formation of Earth's seas is that during the period of Late Heavy Bombardment, scores of icy asteroids and comets impacted the Earth and deposited water on its surface. Scientific evidence also suggests that the planets Mars and even Venus once had bodies of liquid water running along its surface. Analysis from our own solar system suggests that running streams of liquid water on a rocky, inner-planet's surface is not all that uncommon. Evidence suggests that liquid water almost certainly existed on Mars' surface, maybe on Venuses' surface, and we of course know for sure that Earth has liquid water on its surface. Thus, liquid water existed on possibly 3 out of 4 of the surfaces of inner-planets within our system. And because rocky, inner-planets certainly, at least in some solar systems, formed in more or less the same way as the ones in our system, we suspect that liquid water on the surfaces of "Super Earths" in other solar systems is fairly common. Super Earths such as Kepler 186f are far too distant and our instruments far too feeble to use techniques like spectroscopy to determine these worlds compositions. Thus, due to the limitations of present day technology, we do not know for certain whether or not Kepler 186f contains water. Nor can we know for certain what this planet's atmosphere, weather, and geology are like. Because Kepler 186f is both Earth-sized and orbits in the so-called Goldilocks zone around its star and given the commonplace nature of liquid water appearing on rocky inner-planets within our own system, it would be reasonable to guess that Kepler 186f currently, or at some past epoch, contained liquid water on its surface. Inner-planets tend to be rocky planets and so we'll guess that Kepler 186f is also a rocky planet. If this is the case, then we can estimate that this planet is roughly 40% more massive than the Earth. And if this planet is more massive than the Earth, then it will exert greater tidal forces on portions of its atmosphere. This results in any two adjacent portions of Kepler 186f's atmosphere to be compressed more greatly than on Earth. Thus, the atmosphere on this world is far denser and contains much more particulates of matter for any given unit volume. If we guess that this planet rotates like the Earth, then the planet would generate wind within its atmosphere. Assuming that Kepler 186f has tectonic plates, then the collision of those plates would result in the formation of new mountain ranges or other possible geological features. But this world's atmosphere is so dense that abrasion against those geological features caused by this world's wind would flatten out such geological features over enormous time intervals. We suspect that the surface of Kepler 186f is very flat containing many separate rocky islands each separated by small basins and lagoons of liquid water. This is how Kepler 186f and other exoplanets like it get the name "Archipelago world." To be perfectly clear, everything that I have said about Kepler 186f's surface features is pure speculation. Though highly unlikely, the actual surface features might be completely different from everything that we have discussed up to this point. But from the estimates of the sheer number of Super-Earth that are out there, even if just a tiny fraction of them orbited in the continuously habitable zone we can be certain that at least some of them are like what we have speculated about up to this point. This is a near certainty due to the sheer number of Super-Earths out there. 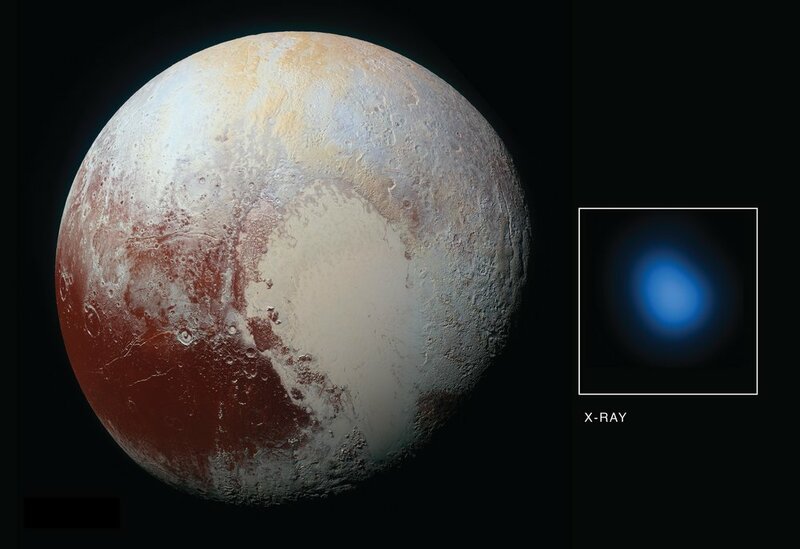 X-ray image of Pluto obtained by Chandra X-Ray Observatory (blue spot on right) and up-close photograph of Pluto obtained by the spacecraft Deep Horizons as it flew by Pluto. If you stood at the right location on Pluto's surface, you would see a range of mountains several kilometers tall. But what would be so breathtaking about this sight is the fact that the mountains on Pluto are made entirely of frozen water. The sky would be totally black except for a light blue along the horizon and the portions of sky just above the mountains. The ground you'd be standing on would have a strange reddish color. You can see some of the surface features we have discussed from the images of Pluto's surface (see image above) obtained by the spacecraft New Horizons as it flew by the tiny dwarf planet in 2015. This image shows, in stunning detail, what the surface of this small world looks like. Even within our own solar system - specifically, within the realm of the Kuiper belt - we expect to find dozens of other planets just like Pluto. We'll call such planets "ice worlds." There are likely many more ice worlds in the Kuiper belt and in other star system in the Milky Way. The exoplanet Kepler-623 is a super-Earth located in the constellation Lyra and it is 1,200 lightyears away from the Earth. Like the exoplanet Gliese 1214b - which is also a super-Earth - astronomers think that Kepler-62e is what's known as a water world or an ocean world. A water world is a planet whose entire surface is covered by a world wide ocean. Not only that but astronomers also discovered that Kepler-62e has a very cloudy, humid, and warm atmosphere. The physical characteristics of Kepler-62e make this world an excellent candidate to find life on. The star Kepler-62 is also orbited by another distant planet called Kepler-62f. Kepler-62f is also believed to contain an enormous worldwide ocean; but unlike Kepler-62e, the oceans of this world would be covered by a tick layer of ice. Unlike the exoplanets Gliese 1214b and Kepler-62e which are bonafidewater worlds, Kepler-62f is more akin to a ice world. In 2015 and 2016 astronomers using the Transiting Planets and Planetesimals Small Telescope (TRAPPIST) and the Spitzer Space Telescope in collaboration with ground-based telescopes discovered a star system—just 39 and a half lightyears away from Earth—consisting of seven rocky, Earth-like planets orbiting an ultra-cool red dwarf star. The star was named TRAPPIST-1 and the planets TRAPPIST-1 b, c, e, f, g, d, and h. This star is only slightly larger than Jupiter and its mass and luminosity are a tiny fraction of that of the Sun. All seven of this star's entourage of Earth-like planets orbit closer to their parent star than does the planet Mercury orbit the Sun. Imagine seven planets crammed inside of an orbit smaller than Mercury's orbit around the Sun—that is precisely the situation in the TRAPPIST-1 star system. These planets are so close to one another that if you were standing on one of their surfaces, you could see, with a naked eye, all of the other TRAPPIST-1 planets in the sky; the nearest one could appear twice as large in their sky as does the Moon appear in our sky. The scientists who originally discovered the TRAPPIST-1 planets regarded the TRAPPIST-1 system as both "unbelievable" and like something straight from science fiction; indeed, although it is far too early to know for sure, I anticipate that the discovery of this system will inspire many future science fiction writers. That sci-fi tangent aside, all of the TRAPPIST-1 planets move in extremely compact orbits that are very close to their parent star. But because the star TRAPPIST-1 is so much cooler and fainter than the Sun, it turns out that three of the planets orbiting this star—namely, TRAPPIST-1 e, f, and g—are actually orbiting in their parent star's habitable zone. That is, a distance that is neither too hot nor too cold for liquid water to exist on those planets surfaces. Not only are the temperatures of these planets what we are looking for in our search for life, but so too are the sizes, masses and compositions. It turns out that all seven of these planets have sizes, masses, and compositions similar to that of the Earth. Let me explain the techniques used by astronomers to arrive at these conclusions. These planets were discovered by observing them pass in between their parent star and the Earth's line of sight. This is called a transit and is like a mini eclipse. The bigger the planet the more light it blocks out; the smaller the planet the less light it blocks during a transit. Based on how much light that planet blocks (which is to say, based on how big or small the dip in measured luminosity is), we can determine the size of that planet. This is essentially how we determined the sizes of all seven of the TRAPPIST planets. We were also able to determine the masses of these planets by measuring their gravitational interactions with each other. By measuring both the size and mass of each planet, astronomers were able to estimate the average density of each planet. Knowing the density of an exoplanet is very important because it gives us a hint of what that planet's composition is like. For example, gas giant planets (i.e. Jupiter, Uranus, WASP 121-b, Osiris, etc.) tend to have low densities because a given amount of gaseous mass tends to occupy a fairly large volume. Now, planets that are rocky with metallic cores tend to have much higher densities because, for some given amount of mass, rock and metals occupy a smaller volume than gaseous materials found in gas giant planets. From the measured densities of the TRAPPIST-1 planets, we are pretty certain that they are rocky planets with metallic cores. This is corroborated by a recent spectroscopic study which confirmed that at least two of the TRAPPIST-1 planets definitely are not gas giant planets. These observational discoveries evoke new questions and mysteries such as: Do these planets harbor life? Do they contain liquid water oceans on their surfaces or underneath ice sheets? How did these worlds acquire such compact orbits so close to their parent star? Do these worlds have atmospheres? All of these questions are, of course, deeply interrelated. For example, if liquid water does exist on these planets (we are pretty certain it does), that has implications about the possibility of life on those worlds. Furthermore, whether or not these planets have atmospheres and what the compositions of those atmospheres are like also have implications about the possibility of life in the TRAPPIST-1 system. Of those four questions I have posed, we are fairly certain of the answer to only one of those questions and that is, how those worlds acquired there particular orbits. The prevailing theoretical explanation is that these planets formed much farther away from their parent star; due to their gravitational interactions with one another, they migrated inward to orbits which were more compact and more close to their parent star. Their orbits then eventually stabilized due to a phenomenon known as orbital resonance. But the other questions, which are essentially a deeper inquiry into the precise compositions of these planets, cannot yet be determined. But using the next generation of telescopes we'll be able to use spectroscopy to determine the compositions of these worlds atmospheres and determine whether or not they even have atmospheres. The James Web Telescope, which is due for launch sometime in March 2021, will bear this task. This telescope will allow us to determine the compositions of these world's atmospheres, using spectroscopy, and it'll be able to detect traces of molecules like water vapor, oxygen, methane, and carbon dioxide if those molecules are present. This telescope is anticipated to be revolutionary and one of the reasons why is because it'll allow us to come much closer to answering the question of whether or not life exists elsewhere in our galaxy. Using this telescope, we'll be able to search for the precursors of life on other worlds; these precursors are molecules such as oxygen, carbon dioxide, and water vapor. 2. “Hubble Spots Recurring Water Vapor Plume Erupting on Jupiter’s Moon Europa”. Sci News, April 14 2017, http://www.sci-news.com/space/hubble-water-vapor-plume-europa-04783.html. 4. Isaac Arthur. "Habitable Planets 4: Life on Rogue Planets." Online video clip. YouTube. YouTube, 27 November 2015. Web. 27 June 2018. 5. SUMMERS, M. (2018). EXOPLANETS: Diamond worlds, super earths, pulsar planets, and the new search for life beyond our... solar system. S.l. : SMITHSONIAN BOOKS.